In the early days there was only one RORO route connecting Surigao and Lipata across Surigao Strait and this was the Lipata-Liloan route using Lipata Ferry Terminal and Liloan Ferry Terminal. There was an earlier route using Surigao port and Liloan municipal port (run by Cardinal Ferry 2 of Cardinal Shipping) but that was in the earliest years and was gone in due time when the Ferry Terminals were built. And there was that really old routes using motor bancas to link Surigao to San Ricardo and Cabalian which are existing until today. And if Dinagat is considered still a part of Surigao then there is still a motor banca connecting that to Liloan. In the 1990’s, the RORO crossing between Lipata and Liloan was languid. At its worst there were only two trips each day and that happens in the off-peak season or when some ferries are hit by mechanical troubles or was in the drydock. This crossing then between Surigao Strait was known to be the base to some of the lousiest ferries in the country but to their credit they do not sink. Empirically, as has been noted in the Philippines there is no correlation between lack of maintenance and sinking. It really depends on the seamanship. The Maharlika ferries then connecting Lipata and Liloan was known to sail even if only one of two of its engines is running. And Maharlika Dos will just stop sailing if its two engines were not running anymore and then clog Liloan Ferry Terminal. And to think this was a ferry built just the decade before. It even seems then that Maharlika Cinco was more reliable when to think she already had an excursion to the bottom of the sea in Coron as the Mindoro Express. The Millennium Uno of Millennium Shipping was no more reliable then being very old already and there were instances she simply conks out and is not heard for months. Many will then surmise she was cut up already and when many think she was gone she will reappear suddenly. I was not too surprised by the performance and lousiness of these ferries because I had already observed the pattern that this was an affliction of many Marcos transport companies. Maintenance is lousy and there is no management to speak of if based on management books. Three trips then in a day in one way was just enough for the traffic. Two trips is bad especially if one arrives in an off-hours because that will mean hours of interminable wait. Baddest is if one just misses a ship. That happened twice to me when I missed the 12nn ship in Liloan and I have to wait for the next trip which was 11pm. Mind you there is really nothing to go to, nothing to do in Liloan and the nearest semi-urbanized town Sogod is more than 40 kilometers away. There was also no cellphone signal then there in Liloan. There were also many times I reached Liloan in late afternoon and the next ferry was still that 11pm ferry because the 5pm ferry is missing. There are not many vehicles crossing then yet and the only buses crossing were the Philtranco buses to and from Manila (it was Pantranco South earlier). The long-distance trucks still have to discover this route then. 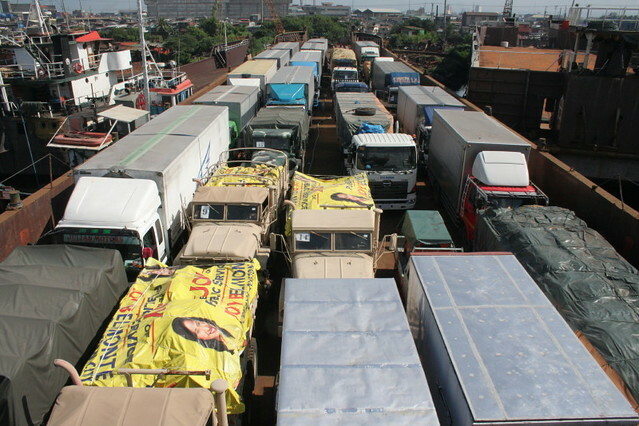 Most trucks crossing then were Mindanao trucks that have goods to sell north. Slowly the traffic grew. There were even those that bring their vehicles to Manila so they will have a car there. And slowly the trucks from Manila began using this route as well as the trucks that have a commerce between Southern Mindanao and Cebu. The Bachelor buses also started their route to Tacloban and Ormoc. That then proved that the old ferries of the route – Maharlika Dos, Maharlika Cinco and Millennium Uno were inadequate. The first challenge and the first improvement was the arrival of the Super Shuttle Ferry 5 of Asian Marine Transport Corporation (AMTC) which arrived in the late 1990’s. The Super Shuttle Ferry 10 replaced it later. Along the way, Asian Marine Transport Corporation also rotated other ferries there. The fielding of a lone AMTC ferry was just enough to fill up the needed lack of ferries in the route especially since Maharlika Dos and Millennium Uno never had sustained periods of reliability. It was also welcome since it was cleaner, faster and had an airconditioned accommodation plus it did not smell. Things changed when Benit port at the southern tip of Panaon island was built by Gloria Macapagal Arroyo, she who is wont for duplicate ports. However, Benit is not a simple duplicate port since its crossing distance is much shorter and so at the very start it was a threat to Liloan like when Allen displaced San Isidro port in Samar. At the start, nobody plied a route to Benit. Maybe the incumbent ships of the route didn’t want a change because after all they can charge more in the longer route. But that proved shortsighted. Gloria Macapagal Arroyo then gave the operation of the port to Montenegro Shipping Lines, her favorite shipping company. Maybe to forestall any loss she made it a buy one, take one deal. She also gave the operation of the very profitable Matnog port to Montenegro Lines! As they say in the Philippines, iba na ang malakas! Montenegro Lines then proceeded to operate a Lipata-Benit route. Suddenly, the former pliers of the Lipata-Liloan route found they have been outflanked. The crossing time to Benit is just over a third of theirs. And woe to them, the Manila bus companies which had a route to Liloan extended their route to San Ricardo (which has jurisdiction over Benit). But don’t think the Manila buses goes to Benit port. They don’t. One still has to take a 2-kilometer habal-habal ride to the port. Montenegro Lines made a killing in the Benit route. Their rates are almost the same as the Liloan rates and yet they only travel 3/8 of the distance. If that is not tubong-lugaw, I don’t know what is. The passenger fares are also much higher per nautical mile than the Liloan fares. And ever since from then the ridership and load of the Liloan ferries have been on the decline. There was even a time when all buses – Philtranco, Bachelor and the various colorum buses were taking the Benit route. Then came the Typhoon Yolanda tragedy. With the surge in relief and rehabilitation efforts suddenly there were complaints of mile-long queues of trucks. It was not only because of Yolanda. By this time the forwarders and shippers have found that sending a truck especially a wing van truck to Mindanao is cheaper than a container van and it arrives earlier. This was also the time too when Manila port congestion and Manila traffic became issues and the forwarders and shippers found it was better to send a truck down south than try to beat the traffic and congestion in Manila. And the benefit is double if the origin is LABAZON (CALABARZON without Cavite and Rizal). By the time the cargo is loaded in a container ship in North Harbor the comparative truck will already be making deliveries in Mindanao. And so MARINA approved the fielding of Cargo RORO LCTs which was designed to take in the trucks and its crews. Supposedly it does not take in passengers but it seems there are exceptions. The people call it “2GO” there because the operator is NN+ATS. The Cargo RORO LCTs are just chartered but they are the brand-new China LCTs which are called “deck loading ships”. Along this way, AMTC lost its route service because they lacked ships and they pulled out the Super Shuttle Ferry 18 so it will retain its Roxas-Caticlan route. Sta. Clara Shipping/Penafrancia Shipping then appeared in the Liloan-Lipata route. I thought there was an equilibrium already. But lo and behold! the much anticipated and already announced FastCats of Archipelago Philippine Ferries (which were also the owner of the lousy Maharlika ships appeared) and they brought not one but two new catamaran FastCats which are faster and has higher rolling capacity than the old ferries in the route. They might have really been entitled to two since previously they had two ships there but one already sank, the Maharlika Dos and the others were sold, the Maharlika Cuatro and Maharlika Cinco (the first was a replacement for the latter). Lately, it seems FastCat pulled out one of its crafts but is still sailing 3 round trips a day (or at least two on weak days). And being fast and new it is pulling in the vehicles. Meanwhile, the Cargo RORO LCTs are suctioning the trucks as it is the cheapest transit available. With those two developments even Montenegro Lines in Benit is affected. But more affected are the other ferries in Liloan that they now resort to “callers” in the junction leading to Liloan port. How fortunes change! In the past just when a ship is arriving there was already a queue of vehicles for them. Added to the fray is Millennium Shipping which is not quitting yet. The Grandstar RORO 3, previously of Archipelago Philippine Ferries appeared and it is using the Liloan municipal port. Reports say it is Millennium Shipping that is operating it already aside from their Millennium Uno. Times have changed. Where before three or four trips a day seemed adequate it seems there are about 15 trips a day now but not all are full. The way I sense it with the Cargo RORO LCTs and FastCat it is already a dogfight now and there might even be an excess of bottoms already. Well, that is good as the public might benefit. However, I have doubts as I noticed MARINA never ever learned how to compute rates even in light of cheap fuel. I wonder if fuel consumption is ever factored in their rates. I just wonder if AMTC and Ocean King I are thankful they are no longer in the route.